Are you trying to lose weight? Are you already counting calories, you are constantly hungry and still you can’t get any results? It might be that you are eating the wrong kind of food that sabotages your weight loss. Research studies find that losing weight is less about reducing calories and more about eating the right kind of food. But haven't we been told that a calorie is a calorie no matter where it comes from? Even though it might defy our sense of logic in the first place, but our bodies do not run like machines where energy input equals energy output. Our bodies are controlled by hormonal responses. For instance, 100 calories from carbohydrates will have a different impact on your body as 100 calories from protein or fat, due to the hormones your body releases. The individual resting metabolic rate was determined, and everyone was assigned to a diet with a caloric deficit of 500 calories. The men consumed each diet for 50 days whereas women consumed the diets for approximately 30 days. Mean decreases in body mass, total fat mass, trunk fat mass, and lean body mass in men who consumed a very low-carbohy- drate ketogenic (VLCK) diet (n = 8) or a low-fat (LF) diet and in women who consumed a VLCK (n = 7) and LF (n = 6) diet. In another two years trial, 300 people were set on either a low-fat diet, a low-carb diet or a Mediterranean diet. The researchers aimed to keep the calories equal between each diet (which of course is hard to monitor in a two years experiment on humans, so let’s not keep that for granted). Obese volunteers were assigned to diets in which the calorie intake was kept constant at 1000 calories a day and 90 % of it was provided in turn by carbohydrate, fat, or protein. To ensure an accuracy of the study, the volunteers were stationed in a hospital and the scientist exluded everyone who deviated from the strict meal plan. They switched the diets after 5-9 days to further ensure that the results are not entirely dependent on body type. The weight loss was the greatest when 90% of the calories came from fat, second best weight loss was seen with the 90% protein diet, but the 90% carbohydrate diet barely showed any weight loss. Daily changes of weight of patients on 1000-calorie diets of body-weight different composition (mean of 5-9 days on each diet). There are many more studies showing a similar outcome [4-19]. However, the question arises why this would be the case. A variety of factors play into account, including the effect of different food components on our hormones (studies regarding this topic are explained in this video) and our metabolism. The study included 164 overweight participants who were split into three groups and were assigned to a low-carb, moderate-carb, or a high-carb diet for 20 weeks. The diets were controlled for protein and calories and the energy expenditure (total number of calories the participants were burning) was determined after 10 and 20 weeks. The researchers found that after 10 and 20 weeks those on a low-carb diet burned about 250-300 calories more per day than those on a high-carb diet. 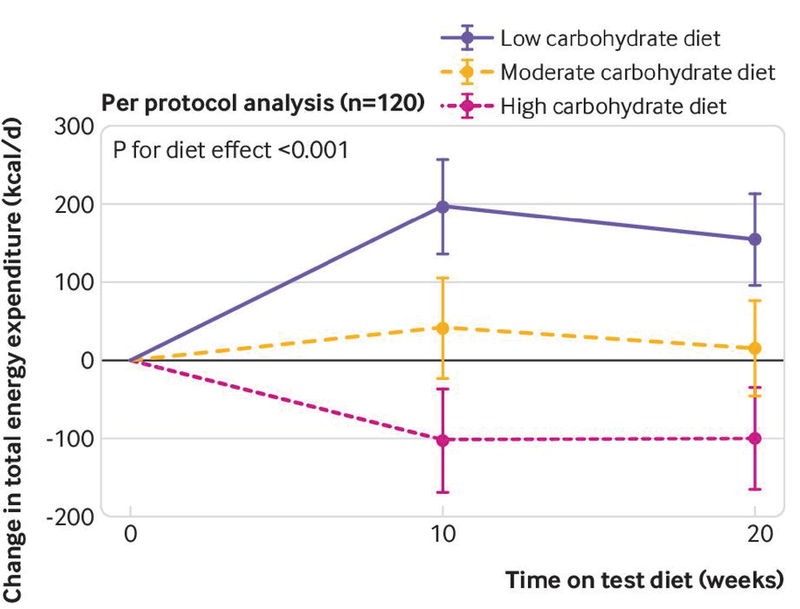 Low-carbohydrate diets are more successful compared to low-carb diets due to their potential to boost the metabolism.